Sit down for a moment, and imagine yourself on a front porch, its paint chipped and fading, in the slow heat of a Southern summer. Picture the sun going down, and the day reaching that moment between light and dark when suddenly the porch doesn't seem quite so safe any more and thoughts turn to stepping inside and closing the door. Perennials lives in that moment of disquiet in a place you call home. Bryce Gibson has crafted a murder tale rooted in the rural world of the South, where families all know one another, where a serial killer stalks in a community that believes such things happen somewhere else, not here, not with us, in a place where you peer from behind twitching curtains and gossip about the moral failings of others. This killer is hunting down a surprising target - people who share their name with plants. Mary Gold is the first we encounter, but not the last, and teenagers Dusty Miller and Nandina Bush fear they may be targets on the list. The burn is slow in this story - deaths happen quickly but then we settle into the story of Dusty and Nandina, their blooming romance and the branches of family history that reach out across the landscape in which they live. Pieces of the puzzle are shown to us, but not slotted into place. Not yet. This story takes its time until, late in the game, things pick up pace, so fast that the innocent teenagers can't seem to follow what's going on until it may be too late. There are some oddities in the writing - for example, Dusty's parts of the story are written in first person, while other characters are in the third person, which is a little jarring when you switch, and there are some parts of the story which happen off-camera, even towards the climax, which feel like they might have been part of the central narrative. But there's a great deal to like here. Gibson has an elegant, easy style, and his characters feel very real, especially his central duo, tiptoeing towards love, feeling it is the biggest thing in the world even in the midst of fearing for their lives. Keep an eye on this writer, whose career shall surely grow. 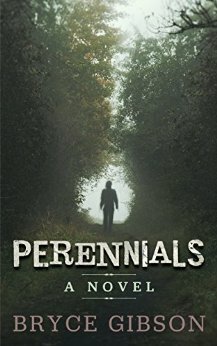 A copy of Perennials was provided in exchange for an honest review. To find out more about Bryce, you can check out the links below. Best of luck with the new book, Bryce!